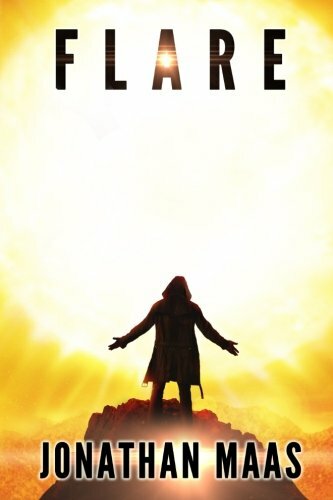 In “Flare” by Jonathan Maas, the earth is bombarded by deadly solar flares, and the planet and the people are devastated. Technology is destroyed and the majority of the population has been painfully killed, or permanently damaged physically. Nighttime is the only time the survivors can be outside. Everything becomes a struggle. Finding food, clean water and avoiding any touch of sunlight is critical. The evilness of humanity has also reared its angry head with many of the survivors. There are still some willing to help others but they live in constant fear for their life. When the word gets out that there is a safe haven called Salvation, survivors begin to head there for protection. As a brother and sister begin their journey to this place, they help rescue a female survivalist on the road who plays a critical role in their survival. In time they meet up with Zeke, who is mute. It appears that Zeke is part of a prophecy involved with this event. He is on a mission of peace as he tries to determine his role in the scheme of things. The group members separate and often reunite on their journey. Along the way they begin to figure out what their roles are in helping save what is left of civilization. It is not an easy path to follow. I live in the extremely hot desert in southern California. Temperatures are known to hit over 120 degrees. As I read, I felt grateful it is wintertime because I could really relate to what the survivors were experiencing during my summers. While my skin does not fall off of me in the sunlight, sometimes it is hard to breathe, my jewelry burns me, and I have to blacken the windows in my home. Living this kind of life really made “Flare” seem real to me, like it is something that could actually happen. That was unnerving! I also found myself getting caught up in the characters. The author gave them so much depth, they were like real people to me. I found “Flare” by Jonathan Maas to be completely enthralling, terrifying and unique. Highly recommend reading for fans of post-apocalyptic fiction with a touch of metaphysical elements.